Created many millenia ago by the drow to help them wage their wars of envy against the surface elves to retake the lands of the sun, this darkly beautiful platinum amulet looks like a stylized crescent moon with a skull face. A tiny platinum serpent is looped around the top crescent. Legends say that this amulet was stolen from the dark elves by creatures of the deeps even more horrible, and thus it passed from the histories. The wearer of this amulet who is attuned to it is immune to detrimental effects from natural light, including daylight. No spell or magical effect that produces light or illumination of any kind can blind the wearer. He has resistance to radiant damage. The wearer is entirely unaffected by magical darkness; he sees normally in it as if prevailing light conditions existed. The real power of the amulet, however, lies in its mass combat effects. When above ground, the wearer has but to will it (this is an action) and dark clouds will gather above his head, spreading above him in a 500 yard radius. Any being under cover of this magical cloud is not affected by natural light or daylight, although the cloud does not provide any protection from light-based spells or allow anyone but the wearer to see in magical darkness. The cloud is only affected by the most extreme natural weather conditions, the DC to dispel it is 25, and even a Dispel Magic spell cast using a 9th level slot does not automatically dispel the cloud. The amulet enhances the natural jealousy and envy of the wearer. Spells. The wearer of the amulet can use an action to cast the following spells from it (save DC 18): darkness, blindness/deafness, Evard's black tentacles. Once the amulet has been used to cast a spell, it can't cast that spell again until the next dusk. Destroying the Amulet. The amulet will be destroyed if the most powerful (non-drow) elf in Farland is slain and the amulet is immersed in the life-blood of that elf. This silver-chased +1 splintmail provides an even stronger defense when its wearer is attacked by a flying creature. The armor is +2 against attacks made by creatures that have a fly speed. It belonged to Zestor Half-Elven, also known as Zestor Wyvernslayer. Zestor was an ancient King of the lands of Kelerak. This jet-black +2 sword is unbreakable in normal use, although it can be destroyed in a normal forge. Once drawn it cannot be put away until it draws blood. If the wielder attempts to sheath the sword but the sword hasn't been used to deal slashing damage since it was last drawn from its scabbard, the wielder must make a DC 13 Charisma saving throw. On a failed save, he takes 6 (2d6) psychic damage and is unable to sheathe the sword; on a successful save, he takes 3 (1d6) psychic damage and can sheathe the sword. Inflict Wounds. Once per day when it hits a target, instead of dealing slashing damage, the Blacksword can choose to cast Inflict Wounds on the target, dealing it 40 (8d10) necrotic damage. The Blacksword, not its wielder, chooses when to cast Inflict Wounds, and when it does so, it can immediately choose to grant healing to its wielder equal to half the amount of the damage that it caused using its Inflict Wounds spell. Sentience. The Blacksword is a sentient neutral evil weapon with an Intelligence of 12, a Wisdom of 17, and a Charisma of 17. It has hearing and darkvision out to a range of 120 feet. The Blacksword can speak, read, and understand Dark Speech, and it can communicate telepathically with its wielder. Its voice is low and sibilant. Personality. The Blacksword lies and dissembles often. It may or may not reveal the following information to its wielder, but it believes that it contains the spirit of a powerful vampire. The Blacksword hates sunlight, although it is not hampered by it. The sword's purpose is to deal death to the living and to forward the goals of intelligent undead that it deems powerful and worthy. Its lust for blood must be met. If the sword goes 3 days or more without dealing slashing damage, a conflict between it and its wielder occurs at the next sunset. 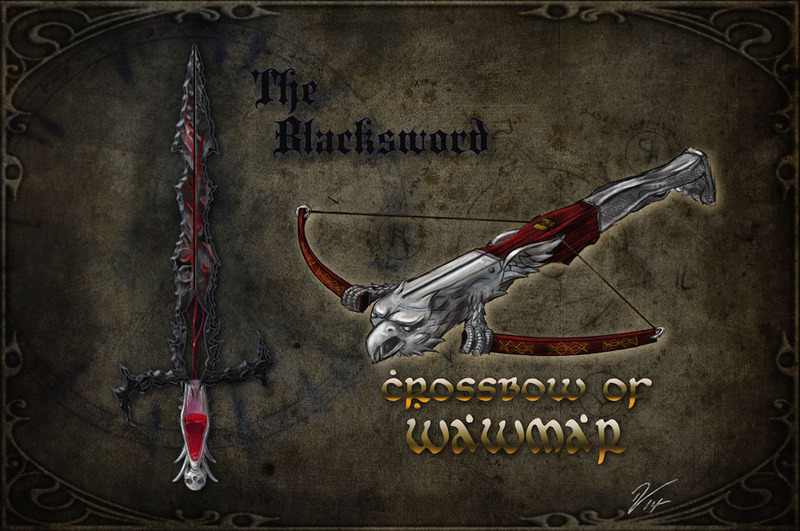 Crafted under the hammers of the most expert metalsmiths in the world, the dwarves of Wawmar, this steel heavy crossbow cannot be broken in battle or under normal use, although it is not indestructible (it can be destroyed in a normal forge). If the user rolls a critical hit while attacking with the crossbow, the target must succeed on a Wisdom saving throw DC 15 or be paralyzed. The target can repeat the saving throw at the end of each of its turns, ending the paralysis on a success. This power functions three times daily; all uses are regained each day at dawn. Crown of Elven Kings, Elebtale, the "Browstar"
This beautiful crown, formed by a circlet of mithril set with a luminous diamond carved to look like a star, serves as the crown of the elven kings in the Summervale. The diamond on the crown sheds bright light in a 10' radius and dim light for an additional 10' radius when the wearer wills it (an action). Elebtale protects its wearer's head like a helmet, giving a +1 bonus to AC. Targets that make a saving throw against illusion spells cast by the wearer of the crown or cast by the crown do so with disadvantage. The wearer of the crown is vulnerable to necrotic damage. The wearer will never willingly be parted from Elebtale until he feels he is dying or leaving for Faerie; he always wears the crown or keeps it within arm's reach. Spells. The crown has 10 charges. The wearer of the crown can expend one or more charges to cast the following spells from it (save DC 18): detect thoughts (1 charge), silent image (1 charge), zone of truth (1 charge), major image (3 charges), nondetection (3 charges), hallucinatory terrain (4 charges), programmed illusion (5 charges), mirage arcane (7 charges). The crown regains 1d6+4 expended charges daily at dawn. Destroying the Crown. If the swan Luminar is slain, the crown will lose all of its power. Created shortly after the Unitary Wars, this artifact was the symbol of power and authority of the first human civilization. Beckair Publius, the founder of the kingdom of Farland, rescued the Crown from the devastation of the fall of Aelfar and used it to signify his right to rule the newly founded kingdom. Publius used the item at the final battle of the War of Vengeance, the Battle of the Death Downs, where it was supposedly destroyed while Publius was in conflict with the Dweller herself. The Crown is rumored to have had the following powers: the crown grants its wearer a +2 bonus to AC, grants its wearer advantage on saving throws versus spells and other magical effects, and provides resistance to slashing damage. If the wearer of the crown grasps a mace or axe, that mace or axe becomes a +3 magical weapon as long as the wearer of the crown holds it. Like most every artifact, its wearer will not willingly give up the Crown and always seeks to wear it. Upon acquiring the crown, the user makes it his life's goal to become monarch of a powerful kingdom by whatever means necessary. Destroying the Crown. Rumor has it that the crown has already been destroyed, though the truth of this is unknown. Histories tell that the only way the crown can be destroyed is by the hand of the Dweller in the Wintervale. This tiny golden upside-down axe, holy to the god Neltak, Lord of Law, limits the ability to tell lies. The wearer of the earring has advantage on Wisdom (insight) checks to detect deception, and disadvantage on Charisma (deception) checks made to deceive. This potion offers potential immunity to attacks. For 1 hour after quaffing this elixir, the drinker is under the effect of a sanctuary spell. The Wisdom saving throw for this spell is DC 14. The enigmatic artifact known as the Gates of Prowess is said to have been crafted by the mage Seldorius. It appears to be nothing but a watercolor painting when first discovered, albeit one created by a skilled artist. It depicts a huge bronze gateway standing alone in a desolate setting. The gateway appears sealed with two aged bronze doors, further banded with bronze. The sides of the gateway are finely carved with a hundred lifelike creatures. Humans, demihumans, monsters, demons, devils, and angels all face the doors with their arms outstretched towards it. Across the top of the archway are carved six humanoid figures of ambiguous race. Each of the figures holds a shield with an inscription on it. The inscription appears in whatever language the viewer of the painting can read, and they say "Strength, Dexterity, Constitution, Intelligence, Wisdom, Charisma," one word per shield. At the bottom of the painting is a scrawl which says, "Accept the challenge if you dare." If a viewer of the painting says, "I accept the challenge," his vision dims, and when it returns, he finds himself standing near the massive bronze gates depicted in the painting. At this point, the figures carved into the sides of the archway come alive and pull the doors open to reveal a stone passage with a light at the far end. At the end of the passage is a stark cavern lit from above by a shaft of light. The rest of the area surrounding the gate is a desolate, empty plane. In the center of the cavern floor, bathed in the column of light, are the six bronze statues with the inscribed shields from the painting. An inscription on the floor in front of the statues reads: "Each must choose by laying hands on the guardian he or she wishes to challenge. Defeat the guardian and receive improved prowess in that ability. Failure means death. You enter as one, you will face your challenge as one." More than one character can choose the same statue. Once all present have chosen a statue, the statues come to life and change form. They immediately attack. The game master should use the rules from the Dungeon Masters Guide Chapter 3 to build a deadly encounter for the level of the player characters. The total number of creatures in the encounter should match the number of player characters present in the cavern. If the player characters defeat every creature in the encounter, the ability score that they choose increases by 1 (to a maximum of 20). Death renders a player character withdrawn from the battle but restored to 1 hit point afterwards. Death during the battle does not discount a player from receiving the ability score increase, but if all the player characters die, none receive an ability score increase. A character who died during the challenge takes a -4 penalty to all attack rolls, saving throws, and ability checks. Every time the character finishes a long rest, the penalty is reduced by 1 until it disappears. No experience points are awarded for this encounter. After the battle has ended, characters find themselves back where they started, except the painting has disappeared to a random location in the Continent of Farland, never again to be found by the same player characters. Invented by the second Cadre of the Wise, these faintly glowing spectacles served many a mage well in his arcane research. Three times per day, the wearer of these glasses can cast detect magic. Expended uses are regained each day at dawn. This powerful helm, crafted for the High King of the Kingdom of Farland in its hey-day, is intricately carved and made of gold; flames are perpetually reflected in the burdgeoned surfaces of the helm even when the wearer is not near fire. The wearer of this helmet has resistance to fire damage. Once per day, the helmet can be used to cast the conjure elemental spell as if it used a 5th-level spell slot. This use is regained at dawn. This finely crafted bullseye lantern is made of solid adamantine. It does not shed light, but it can be opened as an action to cast the gust of wind spell (save DC 13). The duration of this spell is 1 minute and it does not require concentration; as long as the lantern is open, the gust of wind pours forth. The lantern cannot be used again for 2 hours, because the winds inside it must build back up. This item is considered a boon to sea captains to power their ships. Wise captains mount the Lantern to the deck and unfurl their sails after the lantern has been opened. This is the weapon of an ancient dwarven king. It is a +3 mace, but it deals an additional 2d12 bludgeoning damage to humans, elves, orcs, and ogres. It also gives resistance to force damage when clutched or held by a creature attuned to it. This powerful artifact will not function unless it is received as a gift, found, or purchased. If it is taken by force it will not function as magical, nor will it detect as magical. Upon acquiring the mace, the possessor grows a beard; if the beard is shaved, it will regrow in 1d4 rounds. If used to attack or injure a dwarf or gnome, the mace has no magical effects or abilities whatsoever. Spells. The wielder of the mace can use an action to cast one of the following spells (save DC 16) from it: blade barrier, flame strike, harm. Once the mace has been used to cast a spell, it can't be used to cast that spell again until the next dawn. Destroying the Mace. While possessing the mace, if its wielder is caught in the fire breath attack from a red dragon and the attack deals 100 fire damage to the wielder, the mace is destroyed. This deep navy, almost black cloak is fashioned from very smooth yet durable cloth. Roche often traveled into places where he needed to conceal his "trade goods," as it were, and this cloak helped him do so. The cloak contains a very large breast pocket which functions as a bag of holding. However, the cloak weighs the same as a standard cloak, regardless of what it contains. The cloak also functions as a cloak of elvenkind. Created by the dwarves of Wawmar, this digging implement is made of special hardened magical steel. The properties of the steel include heightened flexibility and durability, along with the ability to "focus" and amplify a hundredfold the striking impact of the user. The mattock is a +1 weapon. The wielder of the mattock can use the mattock to cast thunderous smite (save DC 13); the melee weapon used to inflict the thunder damage from thunderous smite must be the Mattock of Mining from which the spell has been cast. This spell can be cast from the mattock three times per day. Expended uses are regained at dawn. By digging with the mattock, the mattock can also be used to cast the spell move earth. Concentration is not required to maintain this spell; instead the user must continue digging with the mattock, which he can do for 2 hours maximum. The mattock can only be used to cast this spell once per day. Expended uses are regained at dawn. This sturdy metal helmet contains a small box with cunningly designed mirrors inside it. Cast upon the mirrors is a continual flame spell. The helmet projects a beam of light as a bullseye lantern, directed at whatever the wearer is looking at. The box on the top of the helmet has a shutter which may be used to hide the projecting light. Opening and closing the shutter to project or extinguish the light is an action. The helmet otherwise protects the head and leaves the user's hands free. These +1 weapons are invariably melee finesse weapons such as daggers or rapiers. When you make an attack roll with advantage against a creature and you use this weapon, you deal an additional 1d6 damage. Ten percent of these weapons are cursed (determine this when the weapon is first found). Cursed Opportunistic Weapons are treacherous to their wielders. While you are attuned to such a weapon, you won't willingly give it up and always choose to use it when you use melee weapons. When you deal the additional 1d6 damage with the cursed weapon, you take the same damage. Attunement to a cursed Opportunistic Weapon can't be ended voluntarily unless the curse is broken first, such as with the remove curse spell. The second form of ammunition created by the ancient gnomish inventor Zenko-Sag (who hated to miss), these missiles give those who fire them a second chance to hit. The ammunition flies past a missed target, circles around, and tries again. When you fire this ammunition and miss a target, as a free action on your next turn, make a second attack roll against the same target. The ammo only returns once, so you only get one additional attack roll per piece of ammo. Once it hits a target, the ammunition is no longer magical. This evil +2 greatsword was first fashioned an era ago by the Dweller in the Wintervale. Its name in Ancient Dark Speech is a word meaning "dealer of pestilence." It is simply known in Farlandish as Rot-blade. This sword is a sword of life stealing. When rot-blade hits an elf, the elf takes an additional 2d6 poison damage. The first time Rot-Blade inflicts slashing damage on an enemy, the enemy must succeed at a DC 16 Constitution saving throw or be inflicted with a random disease. However, the sword is also infected with some unknown pestilence; whenever the wielder of Rot-Blade uses it to cast harm, he must succeed at a DC 14 Constitution saving throw or be inflicted with a random disease. Rot-blade will only inflict its wielder with one disease at a time. Harm. Once per day when it hits a target, instead of dealing slashing damage, the wielder of Rot-Blade can use it to cast harm on the target (Saving throw DC 16). Sentience. Rot-Blade is a sentient chaotic evil weapon with an Intelligence of 14, a Wisdom of 16, and a Charisma of 18. It communicates by transmitting emotion to its wielder. Personality. Rot-Blade's personality is dark and malevolent. It often transmits a grim glee to its wielder when it kills elves or innocent creatures or when it beholds diseases or illnesses. The evil sword has some inscrutable purpose that it is attempting to accomplish. It will sometimes ring loudly or shine like a torch. Its wielder cannot control when Rot-Blade does these things, and thus it will sometimes end up betraying its wielder in situations requiring stealth. It seems the sword chooses when to leave its wielder, and thus it sometimes seeks to be captured by enemies. This mysterious artifact is shaped like an extra large, man-like skull with 3 eye orbits and fang-like teeth. Its origin is unknown (although the skull is rumored to have come from the god Soggoth who died untimely). Once per week, the skull allows its user to have a perfectly accurate premonition of upcoming events. This premonition is fairly detailed but can be ambiguous. When the skull is left in one location for at least a month, its evil starts to spread. Crime and misdeeds in the geographical area surrounding the skull increase, and birth defects and deformities increase. If the skull is left in the same location for centuries, its evil spreads further and strengthens, and it may have such effects as the corruption of an entire race (these things are left to the DM). Historians attribute the existence of the Duergar race to this evil item. The skull's current location is unknown, but it may rest with the twisted Duergar in the depths of the caverns that riddle Farland's core. Spells. The wielder of the skull can use an action to cast the following spells from it (DC 18 saving throw): Hunger of Hadar, Hold Monster, Create Undead, Blight. Once the skull has been used to cast a spell, it can't cast that spell again until the next dusk. Sentience. The Skull is sentient and chaotic evil. It has an Intelligence of 18, a Wisdom of 16, and a Charisma of 20. It has hearing and darkvision out to a range of 120 feet. The Skull can speak, read, and understand any language known to its wielder, and it can communicate telepathically with its wielder. Its voice is powerful and lordly. Personality. The Ruby Skull, although it will never reveal anything of its origin, speaks and behaves as if it believes itself to be a deity. Its purposes are generally inscrutable, although it seeks to spread corruption and chaos. It also seeks to bring about the downfall of the Dweller in the Wintervale, and ultimately Vornoth. It will sometimes imperiously command its user to undertake tasks that it believes forward these goals. If the user refuses, a conflict between the skull and its user occurs immediately. Destroying the Skull. The skull can be destroyed if it is placed on the throne of Vornoth in his citadel in Malor. This dwarven sceptre, indestructible by normal means, once belonged to the ill-fated Dwarfkings of Dorlhaud. It was wrenched from them by force during their wars with the kingdoms of Zeland and Orland. The sceptre is a Rod of Lordly Might. When its wielder first attunes to the sceptre, his hair turns permanently white. It is made of platinum with many jewels and gems and is worth 20,000 on the market for its jewels alone. Destroying the Sceptre. The rightful dwarven king can destroy the sceptre in the rekindled forges of lost Dorlhaud. 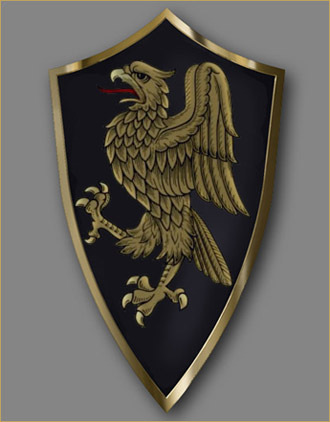 These large, intricate shields, marked with the Golden Eagle symbol of the Kingdom of Kassius, were used by its royal guards in its fight for independence from Aelfar. Only six were known to have been created. This +1 shield can be used to cast Wall of Force. It cannot be used to cast Wall of Force again until the next sunset. Additional Shields of Kassius can be used to create conjoined, larger Walls of Force: using another shield of Kassius to cast Wall of Force on an existing Wall of Force cast by a Shield of Kassius increases the size of the first Wall by the amount provided by the second Wall of Force. If the Wall of Force cast by one of the Shields subsequently ends, the area of effect of the other Wall returns to its normal size. Any number of Shields of Kassius can be used in conjunction to create larger and larger Walls of Force. Alternately, the Wall of Force effect from a Shield of Kassius can be used to end an existing Wall of Force within 60 feet of the Shield as if a Disintegrate spell had been cast on the existing Wall. This storied magical steel shield is enruned and engraved with fierce Dwarven warnings. These warnings blaze on command, allowing its user to cast hold monster as if a 5th-level spell slot was used. The save DC for this spell is 15. This spell cannot be cast from the shield again until the next day at dawn. The full name of this Creagish +2 claymore is "Dragon Slayer," or "Slayer" for short, but it also goes by "The Lady," for it considers itself female. Slayer was known as the chosen weapon of the immortal Creagish hero Darmon Stuart. The sword is unbreakable in normal use, although it can be destroyed in a normal forge. Slayer deals an additional 2d6 slashing damage to evil dragons. Insight (3/day). Three times per day, a wielder who is attuned to Slayer can use a bonus action to obtain advice from Slayer as to an opponent's defenses. The wielder gains advantage on the next attack he or she makes with Slayer. Fly to Wielder. If a wielder that is attuned to Slayer has line of sight and line of effect to Slayer, it can summon Slayer to its hand from up to 50 feet away as a bonus action. Soul Collection. When Slayer is used to slay a creature, if the sword chooses, it can attempt to absorb its victim's soul. Slayer makes an opposed Charisma check against the creature it just slew; on a success, the creature's soul is absorbed. The creature cannot be resurrected or otherwise raised from the dead while Slayer exists. The sword can then use some of the soul's knowledge (the DM decides what the sword learns from absorbed souls). Slayer does not absorb souls as a punishment, and it is actually nurturing with respect to the souls it harbors. Sentience. Slayer is a sentient neutral good weapon with an Intelligence of 13, a Wisdom of 16, and a Charisma of 16. It has hearing and darkvision out to a range of 120 feet. Slayer can speak, read, and understand Dark Speech and Kingdom Common, and it can communicate telepathically with its wielder. Its voice is clear and of indeterminate gender. Personality. Slayer sees itself as female, and it has a rather motherly personality. It chooses who it allows to attune to it, and when it attunes to a wielder it favors, it becomes very protective of that wielder. Slayer has a strict code of conduct and adheres to neutral good tenets at all times. Slayer's goals, surprisingly, have nothing to do with slaying dragons. Instead, it seeks to continue protecting the souls of those who (because of their good deeds and actions) are deserving of protection, and to guide worthy wielders. It fantasizes about eventually establishing a human form and marrying a favored wielder. If Slayer is used to kill a good creature or a creature that the sword sees as undeserving of death, a conflict occurs between it and its wielder immediately. This great staff dates back to c. 2600 F.R., the time of ancient Aelfar. It once belonged to the mightiest priest of Aelfar, and is rumored to have been given to him by Heshtail himself. The staff, like ancient Aelfar, is now lost. This magical quarterstaff looks like an ancient ironwood staff shod in bronze and crowned by a holy symbol of Heshtail. This holy symbol is made from an unknown, indestructible metal. The staff is a staff of striking. It is also a staff of healing, but its bearer can use its charges to cast the following additional spells: raise dead (8 charges), mass healing (9 charges). The user feels strongly compelled by the staff to donate the majority of his monetary possessions to a temple of Heshtail; if he fails to do so after a reasonable span of time (as determined by the DM), the staff ceases to function until he does so. Finally, the staff cannot function within 120 feet of a dragon, either dead or alive. Destroying the Staff. If the staff is plunged into the lifeblood of the most powerful evil dragon in Farland, it will be destroyed. I, Galadhel the smith, shedding tears for the state of Núrion, have crafted this, Gonwe Dīm, to allay the ubiquitous wars. I hereby lay down the uses of this artifact. The Stone must be held to be used; its real power functions on a large scale. This ability is activated automatically under the right conditions, namely when an enemy host attacks the possessor and his host. Then the Stone will make the friendly host all but unconquerable. The Stone also has lesser abilities. It will automatically cause nearby aggressive enemy spell casters to be unable to do harm. It has other uses as well, which can be activated with a thought, but only once per setting of the sun. The Stone can create a radius of peaceful silence, the skin of its possessor can be turned to a stone-like substance to resist the blows of the enemy, and the Stone can paralyze an enemy. But the Stone may never be used to attack, overtly or covertly, for it will flee the hand of its user of its own accord, removing itself up to half a continent away in order to avoid being used for belligerence. Once the stone has fled, no known means of scrying or divination may detect it. You have been apprised and warned of the uses of the Stone; utilize it for the purpose for which it was created. The main power of the Stone lies in its ability to eliminate armed conflict. The Stone causes any army within a mile radius of it that initiates an attack to be severely handicapped. The DM will determine exactly what effects this has. The functions of the item can only be used in self-defense. If the item is used to initiate an attack, the Stone teleports to a random location 200 to 500 miles away, and the user takes 9 (3d6) radiant damage. Overt attacks and offensive actions automatically trigger its disappearance. The DM will determine what qualifies as using the Stone to initiate an attack. No magical means can locate the Stone once it has disappeared. If the user willingly gives up the stone, he will suffer a near unbearable longing for the Stone. Silence. If the possessor of the Stone is targeted by a hostile spell caster that he can see, he can use a reaction to cast the Silence spell from the Stone; he need not have this spell readied. This reaction happens before the enemy spell caster finishes casting his spell; if the spell has a verbal component, the spell fails and has no effect. Spells. The wielder of the Stone can use an action to cast the following spells from it (DC 18 saving throw): Shield, Sleep, Hold Person, Hold Monster, Stone Skin. Once the Stone has been used to cast a spell, it can't cast that spell again until twilight of the next day. Destroying the Stone. The Stone of Silence will be destroyed if it is sunk in the holy fountain that is beloved of the god Tal-Allustiel. These well-wrought metal collars come in all shapes and sizes, from intricately decorated gold to unadorned steel. Crafted centuries ago in the slave-holding Kingdom of Farland, they are designed to ensure the loyalty of any bondsman. When the collar is placed around the neck of a medium-sized humanoid and a command word is spoken, the creature is affected as by a charm person spell cast by the person speaking the command word (saving throw DC 16). While the wearer is charmed, the creature that spoke the command word can issue verbal commands to the creature while it is conscious (no action required), which it does its best to obey. The speaker of the command word can specify a simple and general course of action, such as "Attack that creature," "Run over there," or "Fetch that object." If the wearer of the collar completes the order and doesn't receive further direction from the speaker of the command word, it defends and preserves itself to the best of its ability. To recieve commands, the wearer of the collar must understand the language used to issue commands to it. The wearer of the collar will ignore commands that are obviously suicidal. The duration of this effect is 24 hours or until the thrall collar is removed. Once the thrall collar has been used to cast charm person on the creature wearing it, it can't be used to cast it again until the next dawn. The head of this comfortable walking stick is always carved to look like a natural animal or beast of the wilderness. A leather thong hangs out of its mouth and wraps around the traveler's wrist. This staff has 10 charges. It regains 1d6+4 expended charges daily at dawn. If the last charge is expended, roll a d20. On a 1, the staff loses its properties and becomes a nonmagical quarterstaff. Woodsman. The bearer can expend 2 charges to give himself advantage on a Wisdom (Animal Handling), Intelligence (Nature), or Wisdom (Survival) check. Spells. The bearer can use an action to expend 1 or more of the staff's charges to cast one of the following spells from it, using the bearer's spell save DC: animal friendship (1 charge), conjure animals (5 charges), longstrider (3 charges), speak with animals (1 charge). The ancient and not-so-legendary gnomish inventor Zenko Sag tried to create magical ammunition that could track targets to improve accuracy. As usual, his end result was not what he was "aiming" for. His ammunition would not shoot straight: He could not hit anything in plain sight. During his testing, he found that even though the end result was not his goal, his new invention did have a purpose. If a target was behind any cover, this new ammunition allowed him to bounce the shot off walls, floor, trees, rocks, objects, or other creatures to strike the target. However, it would never fly straight. Zenko was said to have suffered numerous wounds and punctures while testing this ammo; in fact, legends tell that he looked like a walking bandage while developing it. Yet other gnomes somehow valued this ammunition, and soon the secret to its manufacture spread to other gnomish craftsmen. 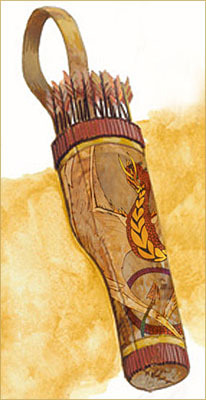 The shaft of this ammunition is twisted and crooked, seemingly indicating to any marksman that it will not fly straight. When you fire this ammunition at a target that has cover, you ignore that cover. However, a target that has no cover is treated as having cover when you use this ammunition to attack it.